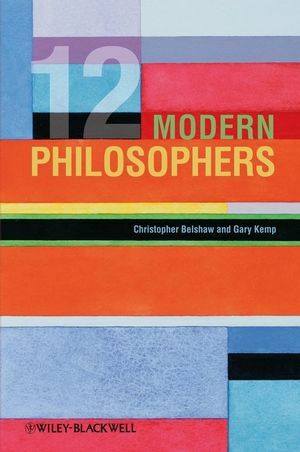 Featuring essays from leading philosophical scholars, 12 Modern Philosophers explores the works, origins, and influences of twelve of the most important late 20th Century philosophers working in the analytic tradition. Christopher Belshaw is a Senior Lecturer in Philosophy and Staff Tutor with the Open University. He works mainly at the theoretical end of applied ethics. He is the author of Ideas (Open University 1998), Environmental Philosophy (Acumen, 2001) and 10 Good Questions About Life and Death (Blackwell, 2005). Another book, Annihilation: The Sense and Significance of Death, is forthcoming. Gary Kemp is Senior Lecturer in the Philosophy Department at the University of Glasgow. He works in the philosophy of logic and language, on Frege, Russell, Quine and Davidson, and on aesthetics and philosophical themes in literature. He is the author of Quine: A Guide for the Perplexed (2005) and, with Tracy Bowell, of Critical Thinking: A Concise Guide (2002, 2005, 2009).